The above Invite is for a function on the eve of the release of a Book entitled VENKAT SAMINATHAN : DEBATES AND DISCUSSIONS. 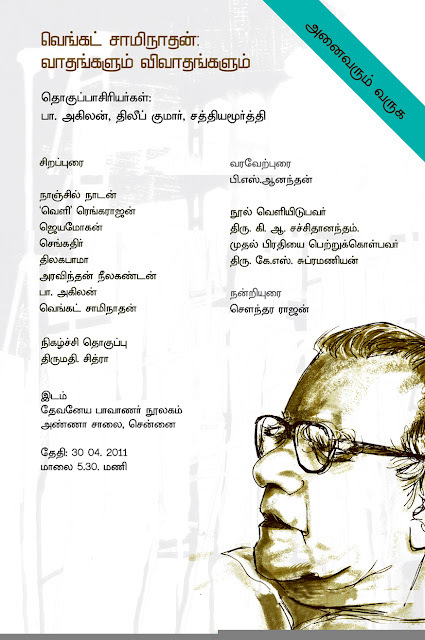 ﻿It is a festschrift by various scholars, critics and friends from India, Sri Lanka and North America on the multifarious works of one of the most fierce and very important literary, art and cultural critic of modern Tamil society, Venkat Saminathan, spanning over five decades. Currently living in Bangalore, the 78-year old Venkat Saminathan, is a legendary persona of uncompromising principles and an ethical vitality that has become so rare during these testing contemporary times. It has taken more than two long years to co-ordinate and compile, to add and delete, to select and edit the writers and their writings. The idea to bring out an honourary volume on Venkat Saminathan emerged during one of those lovely Scotch-inspired moments, on a starry night in JNU's Brahmaputra Hostel room of Shanaa, the wonderful artist friend from Yaazhpanam in Sri Lanka. It could finally be materialised only out of the sustained perseverance of Dilip Kumar, the writer from Chennai and Ahilan, the poet from Yaazhpanam, Sri Lanka. The hardbound tome priced at Rs.300/- which is around 500 pages, is being published by Sandhya Publications in Chennai. Thomas Constantine : The Second Acquirer Of George Grosz's "Eclipse Of The Sun"
My father, Thomas Constantine, now 82, acquired this painting in the late 40's at the age of 19, as payment of a $104 dept from a young man he worked with, who's Father received the painting as a gift from the artist himself. My father accepted the painting as payment, he found it an interesting political depiction of the world. At 19, my father, a Cypriot immigrant saw the meaning of the painting. I remember this painting, rolled up in our Garage, as a little girl. My father sold the painting to Heckscher in 1968 for 15,000. My father has a great explanation of this painting. This is what the artist thought of what was going on in the world at the time he painted it, very, very politically symbolic. The Donkey, the public, who walk with binders and are fed news/newspaper propaganda, Nazi Germany, killed in the name of the church, (the big guy with the wreath of Jesus and a candy coated cross) and other Governments sit around and do nothing (the guys with no heads, writing laws/deals and sit around twidleing thumbs) as the banks get bigger, the dollar sign in the sun, and is all the money made on war, as the people suffer and are imprisoned in their own lives. (the person behind bars on the floor with the scull) Notice the shoes, Rich People in Gov. The Guy who is whispering (with all the guns,tanks and arms under his arm) was thought to be the Man who really started the rise of Nazism that Led Hitler to who he was and what he did. (not sure of the guys name), also notice the rope at the end of what the donkey is standing on, that is something that is used to pull the rug out from under you ... yes, a very interesting painting, and very political. I entered the above post, about my Father selling this painting to Heckscher .. here is a great explanation of the painting.. It is a scathing indictment of the corrupt military establishment of the Weimar Republic. A fat, weapon-carrying industrialist whispers in the ear of a decorated general wearing a laurel wreath, identified as Paul von Hindenburg (1847-1934), who was Field Marshal during World War I and second president of the Weimar RRepublic (1925-1934). Headless ministers ready to carry out their orders surround the two. In front of von Hindenburg is a funerary cross painted red, white, and black, the colors of the former German imperial flag. A bloody sword recalls the general’s deeds during the war. A, tilts precipitously, threatening to throw von Hindenburg, the industrialist, and the ministers down the stairs donkey, the symbol of the German burgher, stands at the edge of the table, wearing blinkers emblazoned with the imperial eagle and gobbling up the lies printed in the press. Under the table, a child is seen behind the bars of a prison representing Germany’s future. The table, painted green and red, the colors of money and blood and into the pit of death below. At the upper left, a dollar coin eclipses the sun,suggesting that capitalism and power, represented by the military-industrial complex, will lead to apocalypse. Above the figures, destruction is seen in the fires in the dark background. A World War I airplane is seen at the upper right. Eclipse of the Sun was exhibited at the Galerie Flechtheim in Berlin in 1927, but it did not sell and Grosz brought it with him when he came to the U.S. in 1933. Research by The Heckscher’s Chief Curator Kenneth Wayne has pieced together its subsequent history. In the late 1940s, the painting came into the possession of Thomas Constantine, a house painter who acquired it as reimbursement for $104 he had loaned a co-worker friend in lower Manhattan. 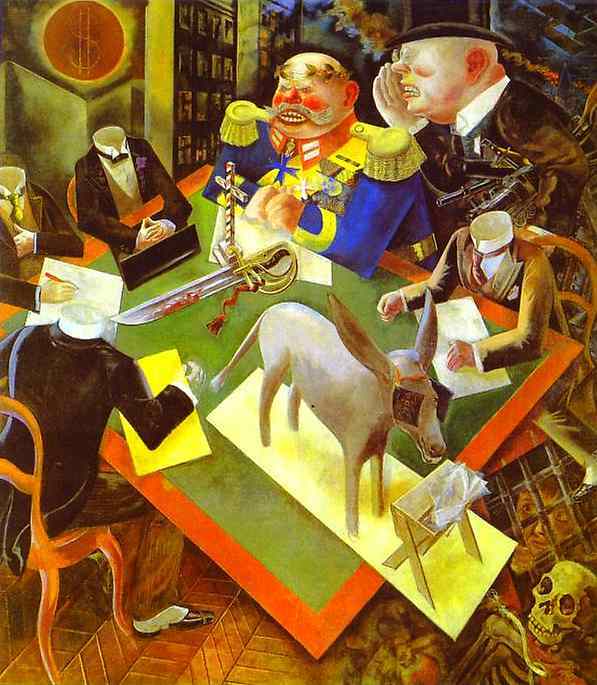 The friend’s father had acquired the painting directly from Grosz. Too large to hang, the painting was rolled up at Constantine’s Long Island home for many years. He eventually tried to sell the painting to several major New York museums, but didn’t find a buyer. In 1968, Heckscher Museum Director Eva Gatling saw the painting at the Harbor Gallery in Cold Spring Harbor. She pursued its acquisition with singular vision and commitment,soliciting contributions from the Museum membership. Today, this masterpiece of twentieth-century art is The Heckscher Museum’s most acclaimed painting and quite plausibly the most important artwork on all of Long Island.